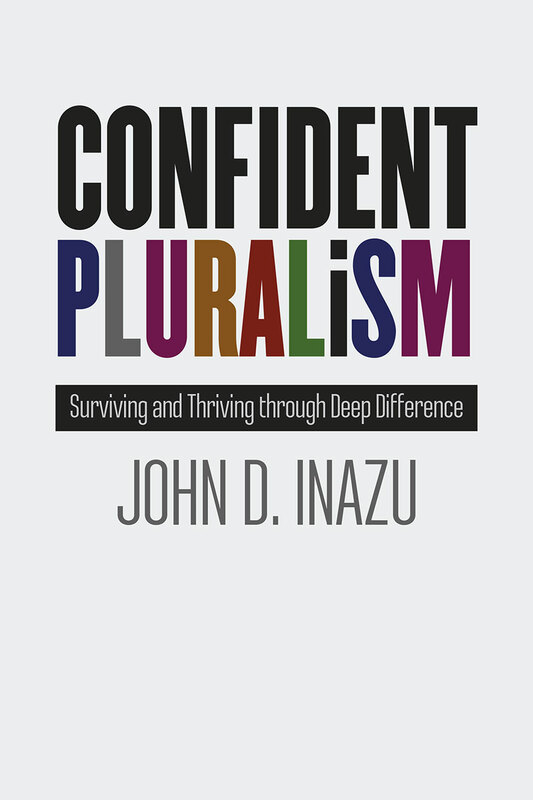 John Inazu's book, Confident Pluralism: Surviving and Thriving Through Deep Difference (Univ Chicago 2016), "is an argument for mutual respect and coexistence" as we live, work, and speak in the world. In Inazu's words, "shared existence is not only possible, but also necessary." Right now, our country seems to be more polarized than ever. Whether in debates over homosexual rights, in challenges to religious liberty, or in recent tensions between law enforcement and minority communities, we live in deep disagreement on fundamental issues. Confident Pluralism, in Inazu's words, "suggests a modest possibility: that we can live together in our 'many-ness.'" Join host Mike Schutt and Dr. Inazu as they discuss Confident Pluralism and its two-fold prescription for a robust and hopeful shared existence. The book is divided into two main parts: Constitutional Commitments (the "legal dimension") and Civic Practices (the "personal dimesion"). First, the "legal dimension" of Confident Pluralism focuses on: (1) protecting the voluntary groups of civil society through the rights of assembly and association; (2) facilitating dissent and disagreement in public forums; and (3) ensuring that generally available government funding is not limited by government orthodoxy. Second, the "personal dimension" of Confident Pluralism aspires toward tolerance, humility, and patience in three civic practices: (1) our speech; (2) our collective action (including protests, strikes, and boycotts); and (3) our relationships across difference. Listen in for some conversation around these issues and a taste of Professor Inazu's hopeful vision. John Inazu is the Sally D. Danforth Distinguished Professor of Law and Religion at Washington University in St. Louis and a Senior Fellow at the Institute for Advanced Studies in Culture at the University of Virginia. He teaches courses in criminal law, law and religion, and the First Amendment. His scholarship focuses on the First Amendment freedoms of speech, assembly, and religion, and related issues of political and legal theory. John’s first book is Liberty's Refuge: The Forgotten Freedom of Assembly (Yale 2012). He has written broadly for mainstream audiences in publications including USA Today, CNN, The Hedgehog Review, The Los Angeles Times, and The Washington Post. He received his academic training at Duke (BSE and JD) and UNC-Chapel Hill (PhD), but he remains an avid Duke fan. Watch Dr. Inazu's Q Talk here. Browse of list of his shorter pieces on pluralism here. Visit JohnInazu.com for more information and links to his scholarly work. Pick up a copy of Confident Pluralism from Hearts & Minds Books. Mike Schutt is the host of Cross & Gavel audio, and an Associate Professor at Regent University School of Law, where he has taught Professional Responsibility and Torts, among other things. He is a graduate of the University of Texas School of Law. He currently teaches American Legal Thought in the Regent MA program and directs Attorney Ministries for the Christian Legal Society. Contact him at mschutt@clsnet.org. In early August, the American Bar Association's House of Delegates will vote on a proposed amendment to Rule 8.4 of the Model Rules of Professional Responsibility. The amendment would subject lawyers to professional discipline for "harassment" or "discrimination," even if the conduct was unintentional or committed unknowingly, and even if the harassment or discrimination is not prejudicial to he administration of justice. The rule proposes that any conduct "related to the practice of law," including running a law firm, representing a client, or engaging in social conduct as a lawyer, would fall under the rule. The rule also expands the classes against which unknowing "discrimination" is prohibited to include "socioeconomic status," "gender identity," and "sexual orientation." Given the current cultural winds, this rule is a dangerous minefield for lawyers, particularly those who don't see "gender identity" or "sexual orientation" as cultural "causes" to be celebrated. Brad Abramson, Senior Counsel with the Alliance Defending Freedom, has been following this issue for several years. About three years ago, a handful of states moved to enact similar changes, and Brad has been on top of the issue ever since. Now that the ABA is following suit, there is a danger that many more states will jump on the bandwagon. Join host Mike Schutt as he and Brad discuss the proposed rule and its specific dangers to practicing lawyers. They discuss the proposal's break with the tradition of lawyer autonomy, its Constitutional difficulties, and the specific changes the new rule would make. They also speculate as to why the ABA Standing Committee on Ethics and Professional Responsibility would ignore 477 lawyers' comments opposing the rule (in contrast to the 17-- just 17!-- in favor of the rule) when revising it. In closing, Schutt and Abramson suggest that attorneys everywhere contact their delegates and urge a "NO" vote on the proposed amendment, Resolution 109, at the ABA House of Delegates meeting August 8 and 9. A list of delegates is available here. Both Christian Legal Society and ADF submitted detailed comments opposing the rule. Read them here (CLS) and here (ADF). Mike Schutt is the host of Cross & Gavel audio, and Associate Professor at Regent University School of Law, where he has taught Professional Responsibility and Torts, among other things. He is a graduate of the University of Texas School of Law. He currently teaches American Legal Thought in the Regent MA program and directs Attorney Ministries for the Christian Legal Society. Contact him at mschutt@clsnet.org. Bradley Abramson serves as senior counsel with Alliance Defending Freedom, where he plays an integral role on the Alliance Coordination Team. He also directs the Bar Association Project, which focuses on encouraging allied attorneys to participate in and influence bar associations to advance religious freedom. He earned his J.D. from the University of Minnesota Law School. Contact him at babramson@adflegal.org.